What will you do with those turkey leftovers, now that the holiday meal is over? 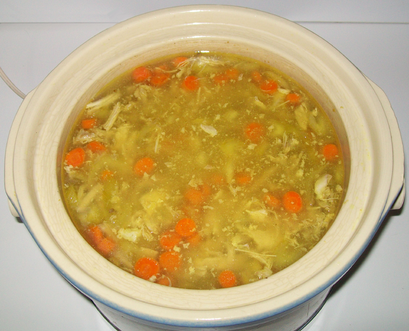 Don't throw it away or feed it to the dog, make hearty turkey & rice soup! Never tried that before and don't know where to begin? Relax, try my simple recipe. And, don't worry, it's easy clean up too! 1. Start off by preparing the turkey scraps. Pull the carcass apart, arranging the pieces in the bottom of the slow cooker/crock pot. Remove the fat, but leave skin intact. Remove any loose pieces of cartilage or small rib bones, leaving the rest. Optional; add the heart & liver (sliced). 2. Prepare the carrots and celery by washing and straining them. Chop the carrots. With the stringy fiber removed from the celery, slice it at an angle. Toss veggies into the pot. 3. Add turmeric, black pepper, lemon juice, a pinch of salt, rice and enough spring or filtered water to float the veggies & cover all else. Cover and cook 6-8 hours on low (209ºF). 4. Uncover just long enough to remove the meat & bones, before replacing the lid. Meat should fall off the bone. Pick the carcass clean of meat, discarding bones, cartilage & skin, saving the largest bone. Chop the meat and return it to the pot. For added flavor, break the large bone in half for the marrow, and toss it back into the pot for seasoning. 5. 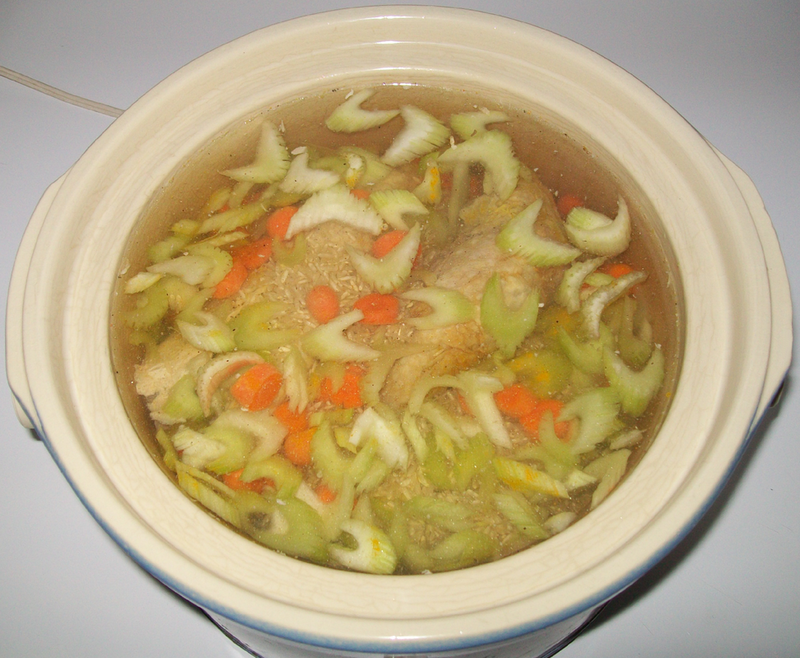 Raise the cooking temperature to high (215ºF) and simmer for an additional 1-2 hours. The soup is done when the rice is. * Have time? Saute the carrots in olive oil to release sugars. * Saute 1 chopped medium yellow onion & a couple chopped garlic cloves to add at the start. * Rice will likely split and resemble cous cous. Avoid this by adding rice at the beginning of the last hour. * Refrigerate and remove any fat that rises, if on a strict no fat diet. * Strain and freeze the soup stock for later use. * Remove ALL bones, before serving. Turkey neck bones can cause choking! * Olive oil has a low smoke-point.